We are a team of professionals with amazing coding skills and convert your design to responsive HTML & WordPress in 24 hrs. 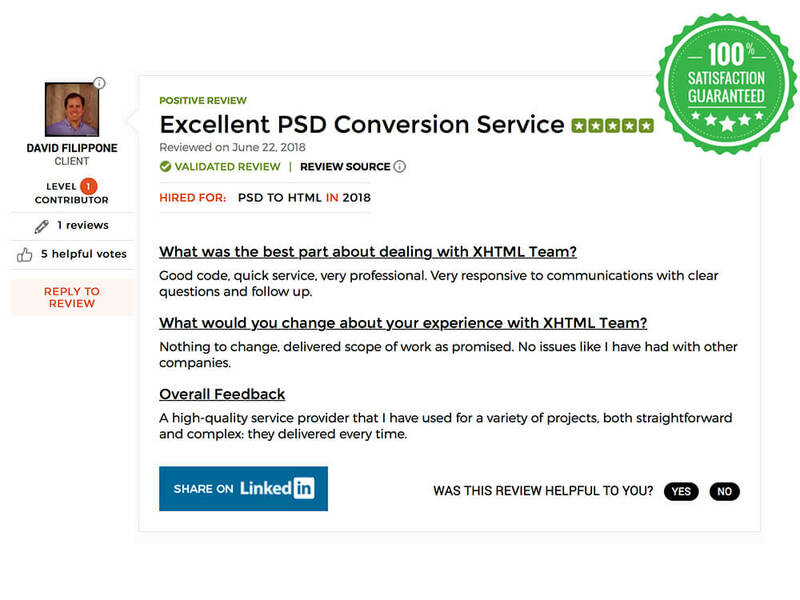 XHTMLTEAM is professional PSD to HTML conversion service established in 2006. With our 10+ years of experience in this field, we convert PSD, AI, PNG, Sketch, Adobe XD to Mobile & Tablet compatible Responsive HTML5/ CSS3 conversion. We never use any software for HTML conversion. All HTML conversions are hand coded by our expert team members. The final pixel perfect code is tested by different methods before delivery. We also work on platforms like Zeplin, Avocode Figma and Invision. As a designer this service has saved me hours of time. The quality is exceptional, and the service is unmatched anywhere else. I would highly recommend XHTMLTEAM.COM. XHTMLTEAM did a fantastic job. The site looks great and the code is clean and easy to understand. I am 100% satisfied. We are trusted, established & dedicated XHTML team offer high end quality PSD to HTML slicing since 2006. We provide upto 30% discount for Church, School, College, Charity and NGO website PSD to HTML markup service. We can work on weekend including Sunday for Bulk/ Top Priority Orders. All files and information we receive will remain confidential. We will never contact your client. We respect your business. We at XHTMLTEAM are available 24/7 to answer your queries rapidly through live chat, Skype or email. All prices come with a 100% money-back guarantee and full copyright ownership of the final html files. Once your site is up and running, we’re still here and ready to help. All Inclusive (Advanced Jquery Integrations, Retina display, Google Page Speed Optimization, Super Fast Delivery, Weekend Availability etc) Premium Package just $299.